Click the image below to view it in its full size. 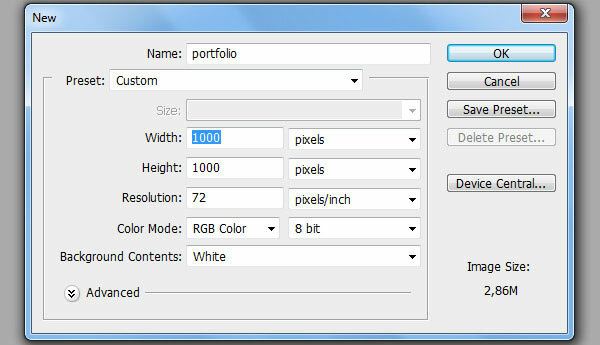 Start by creating a new document (Ctrl/Cmd + N) in Photoshop. Make the document 1000px by 1000px and with a White background. 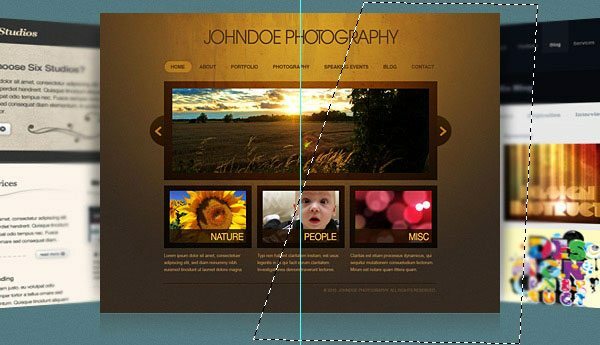 Now add guides on the canvas in order to ensure proper alignment of the various web layout components. You can create guides accurately by going to View > New Guide. 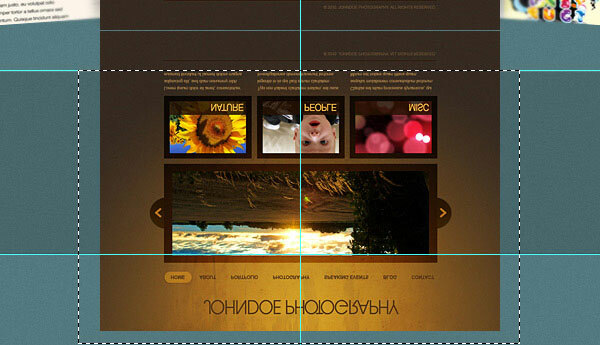 Create vertical guides at 50px, 500px and 950px. 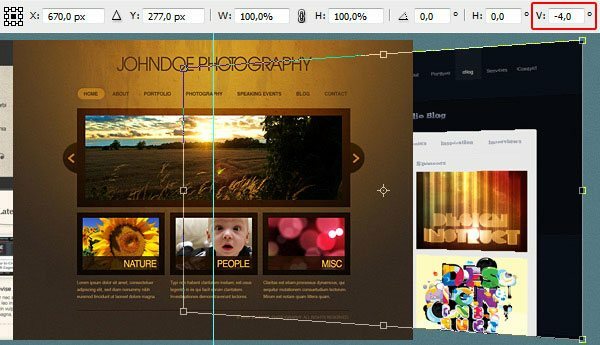 Create horizontal guides at 75px, 467px, 651px and 943px. Double-click on the default Background layer, which will be locked and uneditable; the New Layer dialog window will open. I renamed the layer to "BG" and then pressed OK. Doing this also unlocks the Background layer, making it editable. Let’s create a new group called "Background" (Layer > New > Group) that will contain all layers associated with our layout’s background. Move the "BG" layer into this group. Now, set your foreground color to teal (#547980) and fill your "BG" layer with the foreground color by pressing Alt/Option + Backspace. Now add some noise to our background by going to Filter > Noise > Add Noise. In the Add Noise dialog window, set the Amount to 1%, Distribution to Uniform and check the Monochromatic option. Click OK to apply the filter. 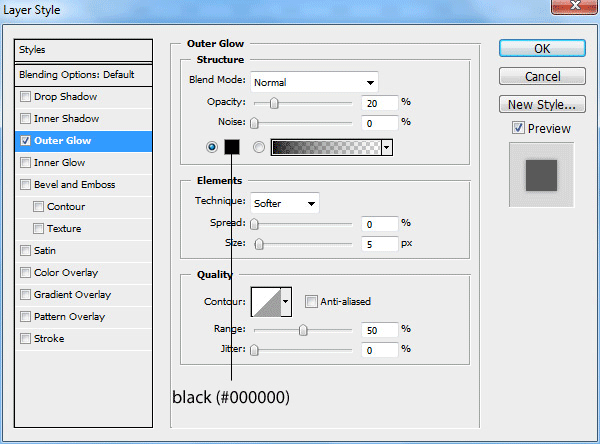 Now set your foreground color to black (#000000), create a new layer (Shift + Ctrl/Cmd + N) and name it "Dark sections". 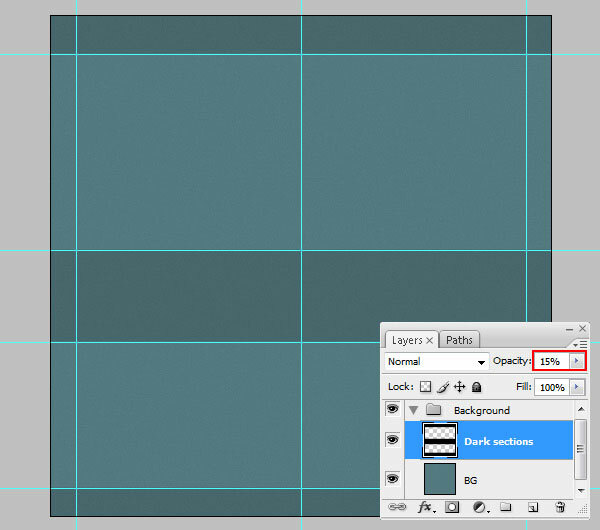 Reach for the Rectangular Marquee Tool (M), select the top part of the canvas (use our guides to make the proper selection), and press Alt/Option + Backspace to fill the selected area with our black foreground color. Repeat the process for the middle section and bottom section so that you end up with three horizontal bars running across the canvas. Now reduce the "Dark sections" layer’s Opacity to 15%. 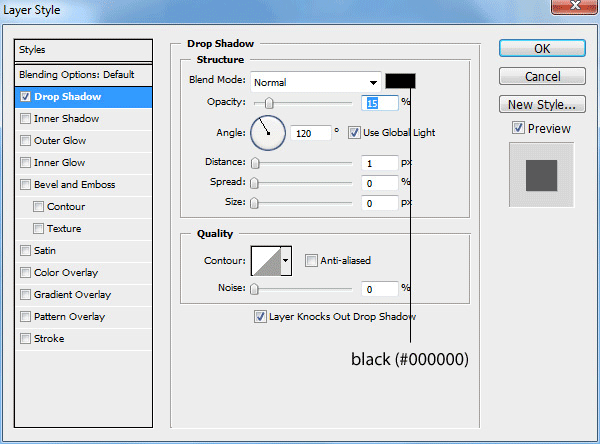 Now create a new group inside the "Background" layer group, above the "BG" and "Dark sections" layers. Let us call this group "Lines". Create a new layer inside the group called "Dark". Make sure that your foreground color is still set to black (#000000) and, with the Pencil Tool (B) set at 1px Master Diameter, draw a solid horizontal line above the first guide at the top. Create another layer inside the "Line" group named "Bright". 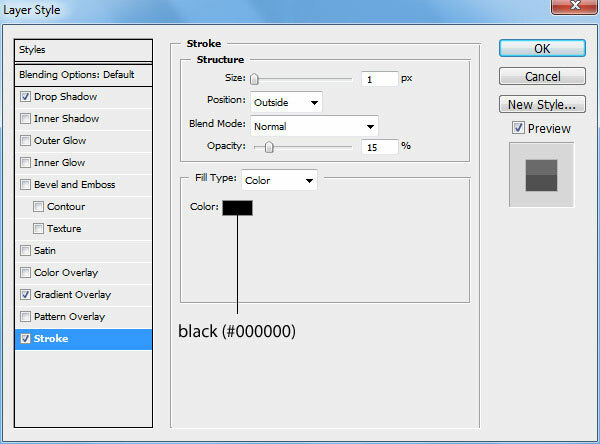 Change your foreground color to white (#FFFFFF) and use the Pencil Tool again to draw a line right below the black one. Collapse the "Line" group by clicking on the small triangle next to the group’s name so that we’re keeping our Layers Panel manageable. 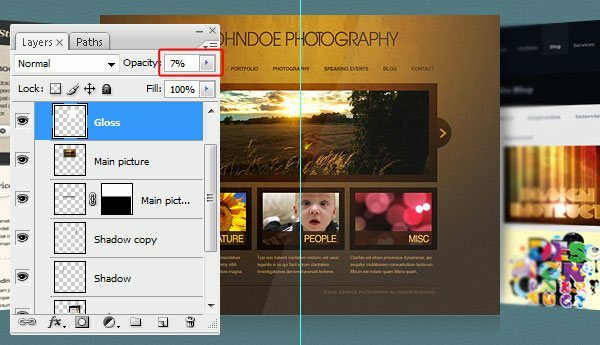 Reduce the group’s Opacity to 12%. Now duplicate the "Line" group (right-click on it in the Layers Panel and choose Duplicate Group from the contextual menu that appears) and rename the duplicate to "Line 2". Move "Line 2" on our second horizontal guide using the Move Tool (V). Repeat the above method for creating two more inset divider lines on the 3rd and 4th horizontal guides. Before we go on, I would like to note that in this layout, we will be working with plenty of layers, which is good so that our work is flexible. However, this also leads to a Layers Panel that can become quite large and unwieldy. 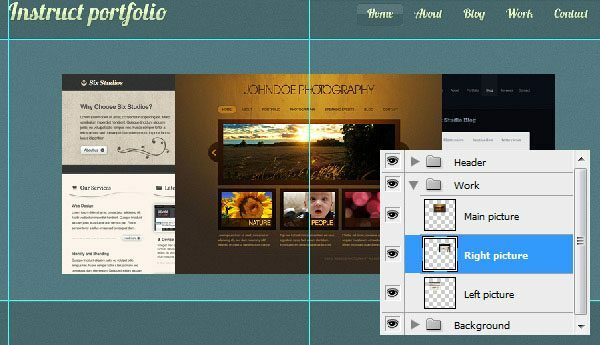 Therefore, whenever we are finished with a component of our web design, we should collapse its layer group as well as ensure that we are naming our layers and layer groups intuitively. So let’s go ahead and collapse the "Background" group since we are now done with that component. 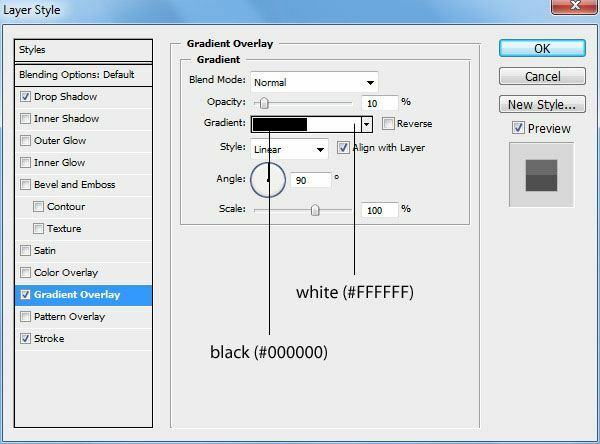 Create a new layer group called "Header" on top of the "Background" group. 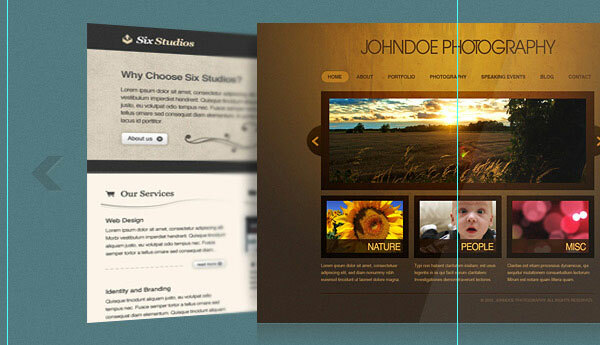 Let us make the site’s logo — it will simply be a text-based logo that has a slick and stylish layer style. To begin, choose the Horizontal Type Tool (T) and set it to Lobster font at 36pt. Set the text color to light green (#E5FCC2) then write your site name. 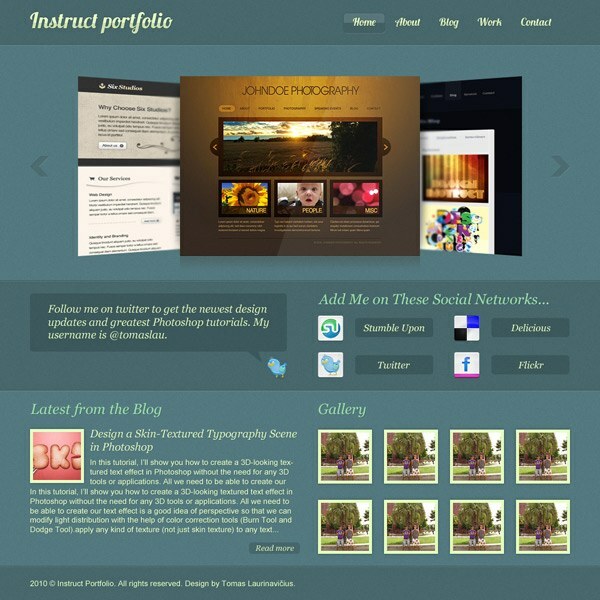 In this instance I wrote, "Instruct portfolio". 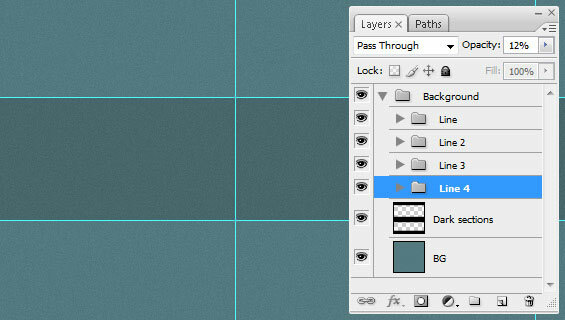 With the text layer selected in the Layers Panel, go to Layer > Layer Style > Blending Options. We will give our logo a Drop Shadow, Gradient Overlay, and Stroke. The following image shows the result of our layer style. Quick and simple, but beautiful, don’t you think? Use the Horizontal Type Tool again for writing out the main navigation menu items. This time, set your text color to a light green color (#E5FCC2) and font size at 18pt. I wrote "Home", "About", "Blog", "Work", and "Contact" — but of course, you should feel free to write out other links. Once done, use the Move Tool (V) to place the navigation menu text at the top right side of the header area. We will copy the layer style we applied to the logo to the navigation menu text. 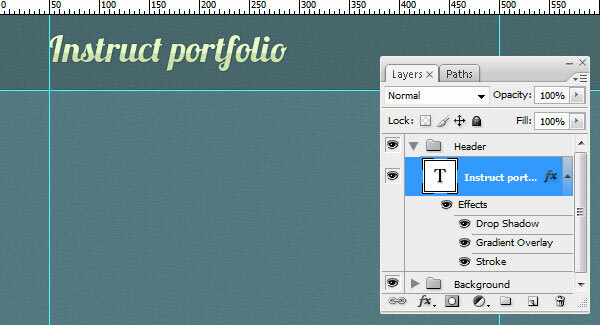 Right-click on the "Instruct portfolio" layer in the Layers Panel and choose Copy Layer Style from the menu that appears. Next, right-click on the navigation menu text layer and choose Paste Layer Style. Now we will create the active link’s background to indicate what page the user is on. It can also serve as our hover state (i.e. we display it when the user mouses over an inactive link). Create a new layer called "Button" (because the active link item’s background looks like a UI button). This layer should be beneath the navigation menu text layer because it will act as its background. Select the Rounded Rectangle Tool (U), set the Radius to 5px and draw the button behind your text. Shown below is the active link’s background shape drawn behind the "Home" navigation menu text. 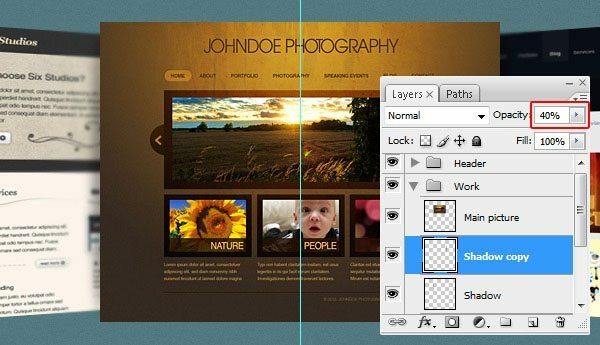 Double-click on the "Button" layer in the Layers Panel to access the Layer Style dialog window. Let’s give our active link’s background shape a Drop Shadow, Gradient Overlay and Stroke. 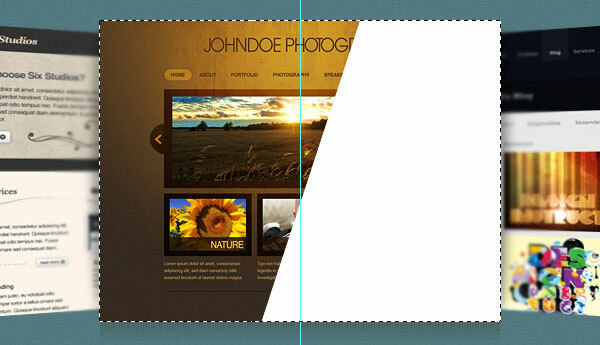 After applying the layer style, simply lower the "Button" layer’s Opacity to 10%. Time to move on to another component of our layout. 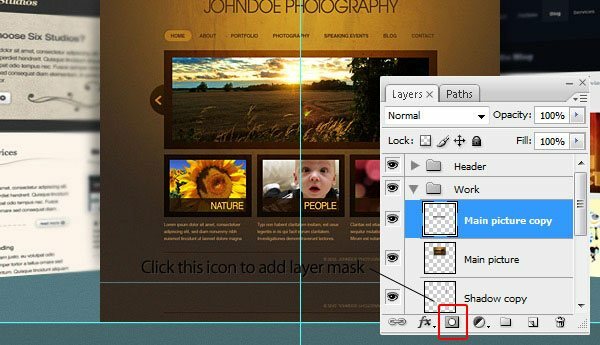 Remember: Collapse the "Header" layer group in the Layers Panel so that it’s out of our way. Next, create a new layer group called "Work". 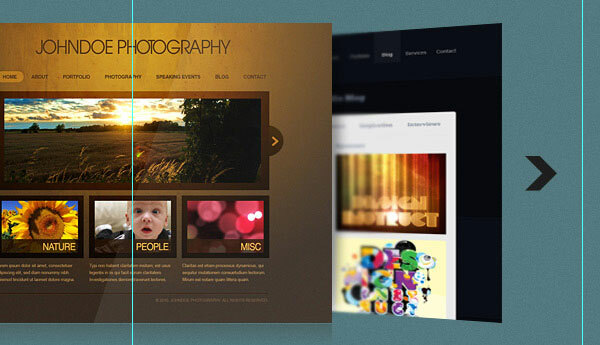 This group will contain the featured works in a 3D image slider. Place your selected images inside the "Work" group as separate layers. 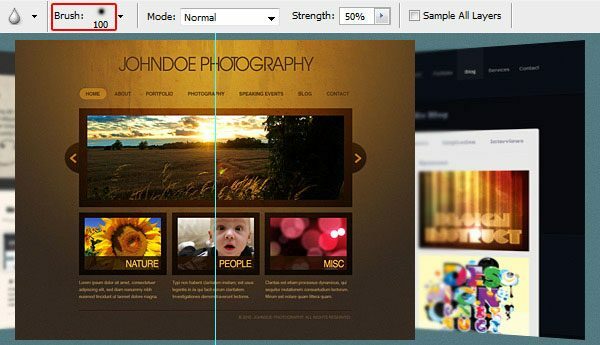 Use Free Transform (Ctrl/Cmd + T) to resize the images as needed. Place the other two images below the middle image and at either sides of it. Click on the "Right picture" layer in the Layers Panel to make it our active layer. Go to Edit > Transform > Perspective and transform the image (as shown below) so that it looks as if it is 3-dimensional. Do the same for the left image but this time angle it to face towards the right. Let us give the featured images a bit of style as well as further support the 3D look. Click the "Left picture" layer in the Layers Panel to make it the active layer. Use the Blur Tool (R) with a soft round 100px brush to blur the sides of the image closest to the main picture. Do the same thing with the featured image on the right. We will now create a shadow being cast by the main image using a quick and easy technique. 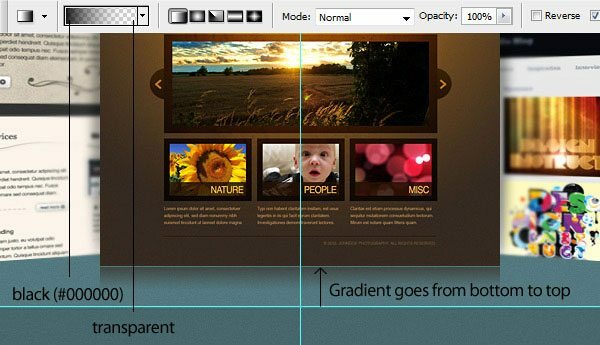 To start, create a new layer under the "Main picture" layer. 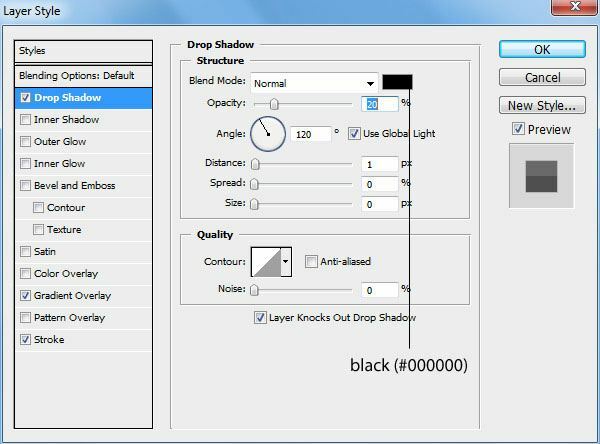 Choose the Ellipse Tool (U) from the Tools Panel and then draw a black (#000000) thin vertical ellipse towards the left. If done right, you should only see the left half of the ellipse. 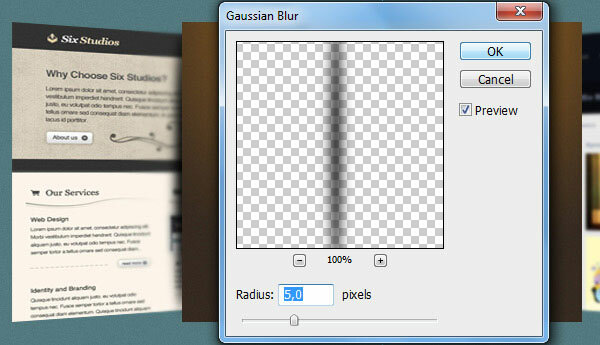 Now go to Filter > Blur > Gaussian Blur, set the Radius option to 5px and then press OK to apply the filter. Lower the layer’s Opacity to 40%. To create the shadow on the right of the main featured image, just duplicate the left shadow layer (Ctrl/Cmd + J) and then use the Move Tool (V) to move it on the right. Now I want to create a slick reflective effect on the main image — it’s really simple to do. 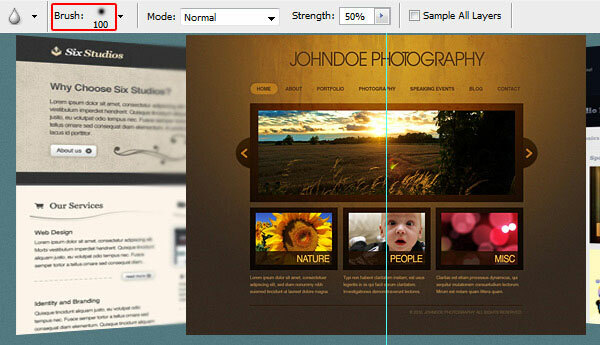 Start by duplicating the "Main picture" layer (Ctrl/Cmd + J). Then press Ctrl/Cmd + T to enter Free Transform mode and set the Height option in the Options Bar to -100%. This flips the image vertically (you could also use Transform > Flip Vertical as an alternative). Switch to the Move Tool (V) so that you can move the duplicated image down below the original image. 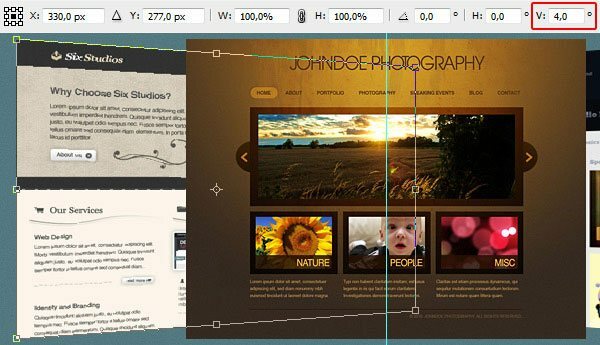 Leave a 1px gap between the original image and the flipped duplicated image. We don’t need the entire duplicated image; we are just interested in the top part of it. So use the Rectangular Marquee Tool (M) to select the area that is below the guide we created earlier on, and then press Delete to remove the selected area. So now, we only have a little bit of the duplicated image. Next, we need a layer mask on it (click the Add layer mask button at the bottom of the Layers Panel, shown in red). Make sure that the layer mask is the active layer. Switch to the Gradient Tool (G). 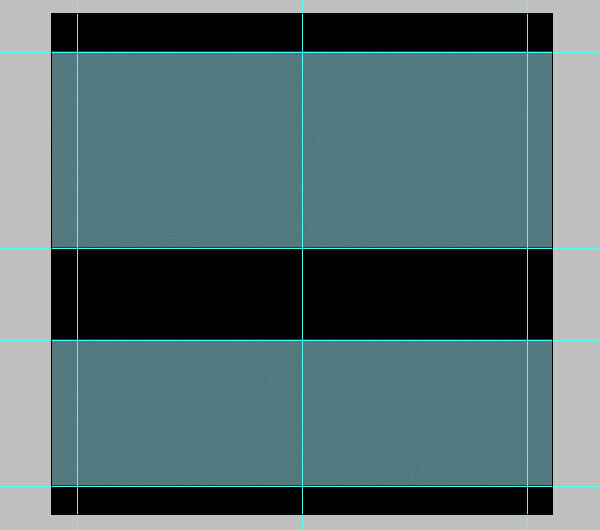 Select a linear gradient that goes from black (#000000) to transparent. Apply the gradient from the bottom to the top. To finish off the reflection, reduce the layer’s Opacity to 40%. What we want to do now is to stylize the main image further by applying a simple glossy reflection on its surface. Start by creating a new layer above the "Main picture" layer called "Gloss". 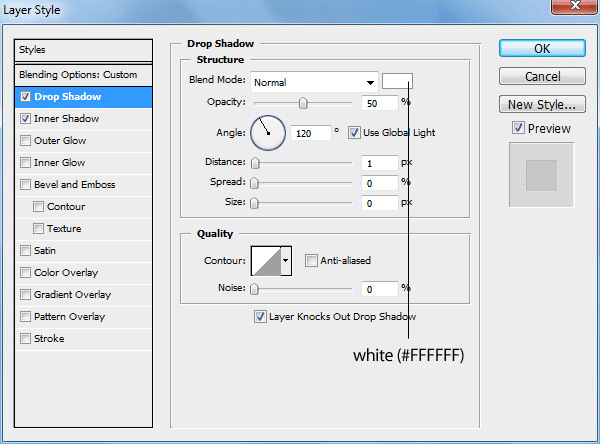 Fill your polygonal lasso selection with white (#FFFFFF). Next, hold down Ctrl/Cmd and click on the "Main picture" layer’s thumbnail in the Layers Panel to place a selection around it. Your "Gloss" layer should still be your active layer, and if not, switch back to it without deselecting your current selection. Go to Select > Inverse (Shift + Ctrl/Cmd + I) to invert the current selection. Press Delete to remove the selected area. This ensures that our gloss remains within the image. You can now deselect your selection (Ctrl/Cmd + D). To finish off the effect, just set the "Gloss" layer’s Opacity to 7%. Moving on, we are now going to create the arrows that will control the movement of the 3D slider. Inside our "Works" layer group, create a new layer named "Right arrow". 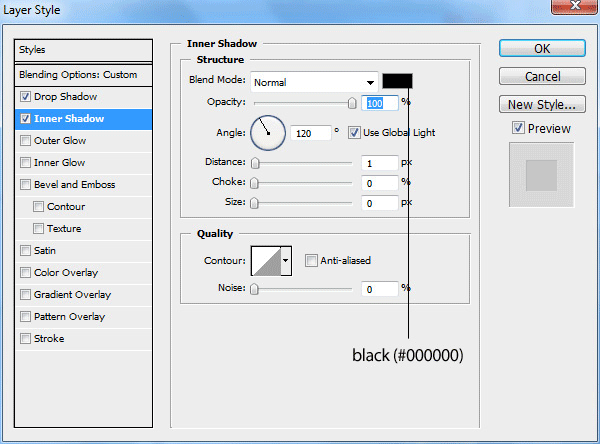 Set your foreground color to dark gray (#1E1E1E) and pick the Custom Shape Tool (U) from the Tools Panel. In the Options Bar, there should be a Shape option dropdown menu. Locate the custom shape named Arrow 2 (this shape comes with Photoshop by default) and use it to draw the right arrow (shown below). Give the right arrow a Drop Shadow and Inner Shadow Layer style (suggested settings for each layer effect shown below). 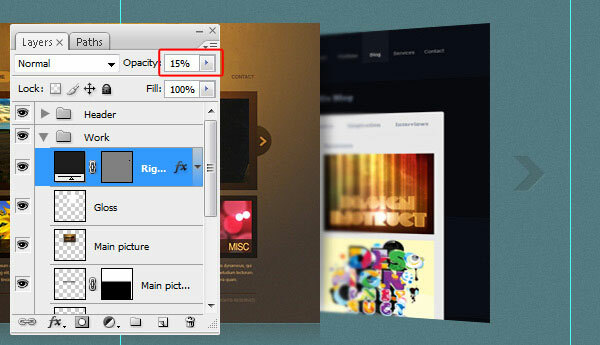 Reduce the "Right arrow" layer’s Opacity to 15%. Well, we will need a left arrow also but — no worries — we can just duplicate the "Right arrow" layer (Ctrl/Cmd + J) and move the copy to the left side of the images. Then, similarly to the reflection of the main image, we will use Free Transform (Ctrl/Cmd + T) to flip it horizontally. To do this, we just set the Width option in the Options Bar to -100%. (You should rename the duplicated layer to "Left arrow" to keep our layer organization maintained). We are done with the "Work" layer group, so you can collapse it in the Layers Panel now. Go to Layer > New > Group and create a new layer group called "Social media". Set your foreground color to black (#000000) and then create a new layer called "Bubble" inside the new group. Pick the Rounded Rectangle Tool (U), set its Radius option to 5px and draw a rounded rectangle on the "Bubble" layer (as shown below). This rectangular box will contain your most recent Tweet. Now pick the Custom Shape Tool (U) and set the Shape option in the Options Bar to Talk 10 (this custom shape comes bundled with Photoshop by default). Draw the shape on the lower right corner of the rounded rectangle box. I want to flip the tail of the talk bubble so that it is facing towards the right of the canvas. We will just use the same technique as before: Free Transform (Ctrl/Cmd + T) then changing the Width option to -100%. After that, select both the "Bubble" and "Talk 10" layers in the Layers Panel. Right-click on one of them and choose Merge Layers (Ctrl/Cmd + E) to combine the two layers. To finish off the talk bubble, just reduce the merged layer’s Opacity to 15%. Now set the foreground color to light green (#E5FCC2) and pick the Horizontal Type Tool (T) from the Tools Panel. Set your font to 18pt, Georgia (Italic). Then write up the Twitter message for our comp. Then right-click on the Twitter message text layer in the Layers Panel and choose Blending Options from the menu that appears. Let’s give our Tweet text layer a Drop Shadow layer style (which we can recreate using the CSS3 text-shadow property in our HTML/CSS template). Open the first icon (twitter_48.png) in Photoshop and place it into our main document. Again, we should maintain our work’s neatness by renaming the social media layers to "Twitter", "Twitter Boxed", "Flickr", and so on. Place the Twitter bird icon below the tail of our talk bubble using the Move Tool (V). Before designing our social media icons, let’s create a heading on the right-hand side of the talk bubble. To start, first switch your foreground color to a green color (#9DE0AD), select the Horizontal Type Tool and then set it at 24pt, Georgia (Italic) font. Type something for your heading, such as "Add Me on These Social Networks…". Let’s copy the drop shadow layer style from the Tweet message; just right-click on the Tweet message text layer in the Layers Panel, choose Copy Layer Style, right-click on the heading, and then choose Paste Layer Style. Position the other social media icons as shown below. Change the foreground color to light green (#E5FCC2) and select the Horizontal Type Tool again. Set your font to 18pt, Georgia (Italic). Beside the social media icons, write the services’ respective names (e.g. "Twitter", "Stumble Upon", etc.). Again, copy the drop shadow layer style from the heading or the Tweet message text layer and paste it onto the social media text layers. Let’s give the texts a rounded rectangle background. You should be familiar with this technique since we have done it with the talk bubble. Change your foreground color to black (#000000), choose the Rounded Rectangular Tool and, with the Radius option at 5px, draw a rounded rectangle below each of the text. 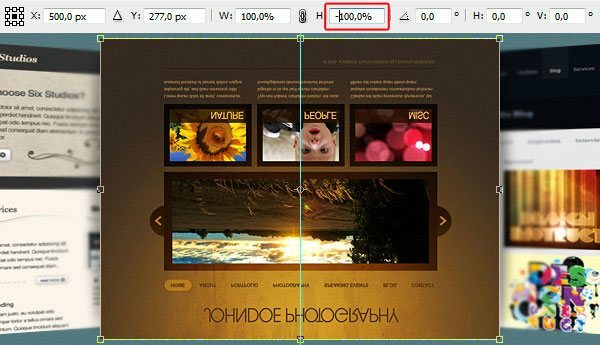 You must also reduce the rounded rectangles’ layer opacities to 15%. Below, you can see that I’ve performed this method on the "Stumble Upon" text. Now just duplicate the rounded rectangle background’s layer (Ctrl/Cmd + J) and move them behind the other remaining texts. This web portfolio also has a blog. What we can do is display the most recent post’s excerpt in the front page. We can do this on the left column, below the Tweet message. You can now collapse the "Social media" layer group. 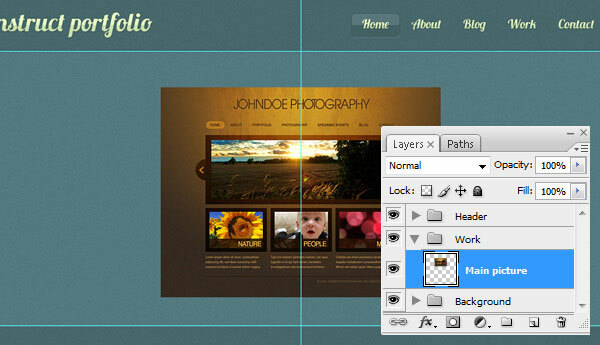 Create a new layer group called "Blog". Change the foreground color to green (#9DE0AD) and choose the Horizontal Type Tool (T). Set your font to 24pt, Georgia (Italic) and write out this section’s heading; something like "Latest from the Blog" should do the trick. Copy and paste the drop shadow layer style that we’ve used in other text layers so that it also has that same consistent design element. Below the heading of the "Latest from the Blog" area, we will display a thumbnail image associated with the blog post excerpt. To begin, switch your foreground color to light green (#E5FCC2) and then draw a 90x90px square box for the blog post excerpt’s thumbnail background. You can use the Rectangular Tool (U) to draw the background. After that, right-click on the layer and choose Blending Options to bring up the Layer Style dialog window. Let’s give the thumbnail’s background an Outer Glow layer effect (settings shown below). Now find a nice 80x80px thumbnail image for your blog post (5px smaller on each side compared to the thumbnail’s background). I just used and rescaled the thumbnail image from this Design Instruct tutorial: Design a Skin-Textured Typography Scene in Photoshop. Using the same foreground color, write your blog post’s headline. Use 18pt, Georgia (Italic) for the headline; it should be slightly smaller than the "Latest from the Blog" heading. Like with the other text layers, copy and paste the drop shadow layer style into the headline’s text layer. Switch your font settings to 13pt, Arial and write out your post’s excerpt. Apply the drop shadow layer style here as well by copying and pasting the layer style from another text layer that has it. Let us make the "Read more" link. We will change our font settings to 13pt, Georgia (Italic). Write "Read more" at the bottom of the post excerpt and apply the same drop shadow layer style from other text layers onto it. Create a new layer under the "Read more" text layer, change the foreground color to black (#000000) and, using the Rounded Rectangular Tool (T) at 5px Radius, draw a rounded rectangle button background for the "Read more" text. Finish it off by lowering the layer’s Opacity to 15% just like with the other rounded rectangle backgrounds we’ve drawn. This area of the layout will contain an image gallery that can contain images pulled from your Flickr account or other portfolio pieces. Let’s go ahead and collapse the "Blog" layer group to get it out of the way, and then create another layer group called "Gallery". We’ll start with the section’s heading. Change your foreground color to green (#9DE0AD), and use the same settings as the "Latest from the Blog" heading — 24pt, Georgia (Italic) — to write out "Gallery". Then, like before, just copy and paste the drop shadow layer style from another text layer that has it. Create another layer group inside the "Gallery" group called "Gallery item". This group will contain an 80x80px image and its background. We will reuse the blog post thumbnail image’s background, so expand the "Blog" layer group, locate the thumbnail background, duplicate it (Ctrl/Cmd + J) and then move the duplicated layer into the "Gallery item" group. Find an 80x80px photo and place it on top of the thumbnail background. Collapse the "Gallery item" group and make 7 copies of it by right-clicking on the layer group and choosing Duplicate Group from the menu that appears. Position the duplicated gallery items such that you end up with a 2-row by 4-column arrangement. This is our last step. 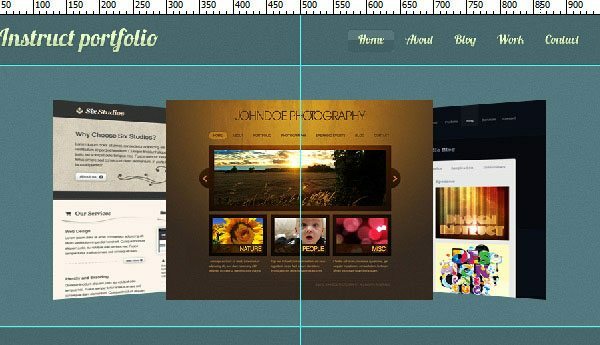 Start by collapsing the "Gallery" group and then creating a new group called "Footer". Change the foreground color to a bright green (#E5FCC2) and select the Horizontal Type Tool (T). Set your font settings to 13pt, Arial and write your footer copyright and other information. After that, just paste in the drop shadow layer style from other text layers. Congratulations! We’ve finished our elegant portfolio web design. We covered some useful and trendy techniques like how to create a nice and detailed textured background, inset dividers, applying drop shadows manually, a technique for creating image reflections, creating a nice talk box graphic, and more. I hope that you understood all the steps used, and I’d like to hear your opinion about this tutorial in the comments below!